Our selection of beautiful dining tables are ready for a lifetime of yummy dinners—but how do you keep them looking like new? This is definitely one of those cases where less is more. Just follow a few simple guidelines and resist the temptation to start spraying the wood-care products you see advertised on TV. Also, as a quick note, the below doesn’t work for wood furniture that’s been painted or has an oil finish. Today’s American fine furniture manufacturers use a finish (usually lacquer or varnish) that does a wonderful job of protecting your wood furniture, but it doesn’t always work immediately. Many finishes require 30 to 60 days to fully cure, which means you need to take extra care to protect the finish when you first get your furniture. Do not place heavy objects on the furniture, avoid using any table pads or placemats, and be very careful about putting anything even slightly hot directly on the surface. Most of the time, simple dusting is all you need to do to keep your furniture looking its best. Use a slightly dampened, clean, soft, lint-free cloth (aka not a paper towel). Old shirts and cloth diapers are ideal, but microfiber cloths also work well. One of the worst things you can do is to dust your furniture with a dry cloth. Dust particles can be abrasive, and dry dusting is like running fine sandpaper over your furniture. A damp cloth picks up and holds the dust particles so they are less likely to scratch the finish. After you’re done, go over the surface with a second clean, soft, lint-free cloth (dry this time) to pick up any remaining moisture. To avoid having to deal with messes that a damp cloth can’t handle, don’t let spills linger. If that splash of ketchup or puddle of milk sits too long, your finish may be damaged. While you shouldn’t use an oil-based soap frequently, if water alone doesn’t do the trick, you can clean up the spill with a clean cloth that has been dampened with a mixture of Murphy’s Oil Soap and water. Don’t forget to dry the wood with another soft cloth. If you have a real mess on your hands and need a stronger cleaning product, try dishwashing detergent on a damp cloth, but make sure that you test it on an inconspicuous area before use. And when done, wipe the cleaned area with water (not too much) to remove any residual soap. Follow with the usual clean, dry cloth. Stay far away from all-purpose cleaning sprays and anything containing ammonia. 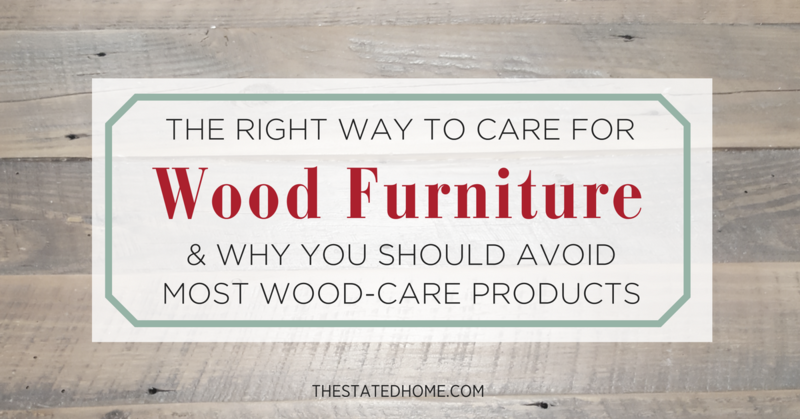 Polish, wax and other products like Pledge may sound like they are perfect for your wood furniture, but some can actually be harmful. Most commercial spray polishes and liquid waxes contain silicone, which many manufacturers strongly discourage using. You don’t need silicone for dusting and it may actually prevent your furniture from ever being refinished, should the need arise. Also, most spray and liquid polishes tend to smear or leave a sticky, dull film behind. And watch out for products containing a high percentage of oil, as they actually attract dust and show fingerprints, without providing any real protection. Please note that the old wax must be removed before a new coat is applied. Otherwise, the wax will build up over the years and cloud the finish. To do that, dampen a clean cloth with mineral spirits. Be very careful not to rub too much in one area or it will eat away at the finish. If you gently rub consistently across the entire piece, following the wood grain, you’ll remove the wax evenly. The process does not usually require very much elbow grease—the mineral spirits do most of the work. Solid wood furniture responds to changes in temperature and humidity by expanding and contracting. A little bit of expansion/contraction is fine, but you don’t want it to get too extreme. Your indoor relative humidity should be in the 35 to 45 percent range to minimize the possibility of warping, cracks and splits. Temperatures that are too hot or too cold can also cause problems, so keep your furniture away from direct sources of heating and cooling, such as radiators and air conditioning/heating vents, and don’t store it in your attic or basement. Now, some thoughts on direct sunlight. Unfiltered ultraviolet rays from the sun and fluorescent fixtures can cause chemical changes in the wood and/or finish, leading to discoloration and damage. That’s why, if possible, you should keep your wood furniture out of direct sunlight. It may be tempting to use the dining table as a multi-purpose work station, but think twice before you do, as any products that contain solvents (like nail polish remover, hair spray, perfume, rubbing alcohol, and air freshener) can damage the finish. Glass cleaner can also be an issue, so if your piece has some glass on it, spray the cleaner on the rag or towel and wipe the glass carefully. Be careful not to drag items across the surface. Paste wax can help to minimize small surface scratches that occur through normal use, but why take chances? Also be careful if you want to put something really hot, cold, or wet on the table. A good rule of thumb: If it’s too hot or cold to hold comfortably in your hands, don’t put it on your furniture. Even computers and stereos can raise the temperature up to 20 degrees without your even noticing! And if an item is damp and sits too long, the damage to your finish and the wood underneath could be serious. One way around this is to put protective padding between the object and the furniture. But what kind of padding is best? Rubber, cork, vinyl and plastic products can damage some finishes, so any protective padding should be cotton, linen or felt. Stay away from cork placemats or coasters, and be careful with electronics and other items that have rubber or plastic feet. If your table comes with separate leaves, store them flat, with the apron side up. As with the rest of the table, keep them in a controlled environment, not in the attic or basement. Invest in fabric storage bags (or, if you sew, make them) to protect the leaves from scratches. Phew! This all may seem like a lot to remember, but if you care for your furniture, it will look beautiful for years.